On this page, we will offer multiple recommendations of books that are useful for the reader in understanding the Mormonism. Books are grouped according to author last name. A Mormon friend requested that I review this book, and I will begin with what I told him: Mormon history is not my area of specialty, and I do not consider myself qualified to offer more than a few observational comments. One Nation Under Gods is a large book -- and it gets one thumb up alone for the wealth of primary material that it brings to the fore. That said, ONUG is under heavy fire from Mormon commentators for alleged use of material out of context. Are they right? I have no way to say who is right; primary sources are out of reach, many cached miles away from me in Utah. If you get this book, simply be aware that you will not get a free ride from any informed Mormon you talk to about it. My one example where I can judge adequately comes from a place where Abanes attempts to show that Joseph Smith was a tempermental and combative sort. Here context was not even necessary to see that he had used examples of Smith engaging in competitive sport and misplaced them as evidence of a specially combative nature -- especially for a person living in the rough and tumble times of 19th century rural America. On the other hand, Abanes also records after these quotes instances of Smith reportedly beating up preachers who disagreed with him. We have received a note on this from Abanes: Allow me to explain that my apparent misappropriation of quotations about Joseph actually are a result of an editorial error wherein the quotes about Joseph and his sporting experiences (pulling up sticks) were juxtaposed with the wrong explanatory comments. This incorrect positioning of text, as well as other numerous hard cover typos and editorial errors, will be corrected in the soon to be released paperback edition (July/August). Please do compare that edition with the hard bound book. You will see that the quotes remain, but the order of them is inverted and previously deleted prefacing comments are re-inserted. I know the feeling, having had an editor do the same to me. I leave it in the hands of the reader to engage these issues for themselves. This is thick book, to be sure -- the kind that has you leaving the bookstore thinking you have gotten your money's worth. And maybe you will get that, if you use Behind the Mask of Mormonism critically. Written by the oft-paired team of John Ankerberg and John Weldon, Mask contains plenty of original quotes from Mormon sources that speak for themselves and covers more topicsv that just about any I have reviewed in this area thus far -- and that's the only reason this book gets one thumb up. Therein, though, lies the first flaw: There is little in the way of depth of research beyond primary LDS material. And then there is the second flaw, one that would make a smaller book unusable: The veneer of sensationalism. Perhaps LDS ceremonies are derived from occult practices, perhaps not; I haven't done the research yet to decide. But if they are, Ankerberg and Weldon could have come up with much more rational ways to say so. Two evangelical scholars who decried the inadequacies of counter-Mormon apologetics rightly castigated these authors for producing not enough of substance in their work; I would not recommend this book at all were it not for the wealth of original source material it references. Use it as a reference tool, and use it cautiously. Craig Blomberg and Stephen Robinson, How Wide the Divide? The modern spirit of political correctness warns us to be on the lookout for any work that is too anxious to find common ground at the expense of truth. I am pleased to report that How Wide the Divide?, despite a certain foreboding, doesn't set truth aside for the sake of "getting along," at least not from the perspective of the Christian side of the debate represented by Craig Blomberg...at least not intentionally. I can't speak of course for the LDS side, represented by Steven Robinson, but Richard Ostling has reported that some LDS were uncomfortable with some of what Robinson said about salvation and grace, and Robinson himself decries certain positions held by what he describes as extremists in his party. I suggest asking someone in the LDS to find out for yourself; but personally, I am having a hard time escaping the conclusion that when it comes to doctrine in popular LDS works, the left hand oft knows not what the right hand is doing, and this to a much greater extent even than in the diversity of orthodox Christendom. Or perhaps it is as two more cynical friends of mine have supposed: The right hand knows what the left is doing, but doesn't do anything about it because what the left hand does is good press for the body as whole. This book isn't a dialogue exactly: It is a case of each author presenting his view on four major issues (Scripture, nature of God/deification of man, deity of Christ/Trinity, salvation/eternal state), followed by a joint conclusion presenting a list of agreements and disagreements. One can certainly learn a lot from this book. One can also see bad news ahead for the LDS side, and this is confirmed in my own book, The Mormon Defenders (see above). Until now the debate has been overwhelmingly done by popular "countercult" writers on the orthodox Christian side; now that the deficiencies in their work is becoming apparent, and scholars of a higher level are entering the fray, one gathers the sense of an impending disaster for Mormon apologetics. Blomberg sounds scholarly and collects data holistically; Robinson spends much more time begging the question and explaining away problems in his position. Blomberg hits and hits hard in many places, and wonders about inconsistencies being taught between one LDS spokesman and the next; Robinson is often reduced to having to agree, admitting to past mistakes and wild speculations by early LDS leaders, admitting that certain LDS doctrines cannot be found in the Bible (including the idea that God has a body of flesh and bone , which is said not to be in the text "explicitly" -- read: it must be assumed and read into the text), offering up convoluted "cow eating grass" explanations and irrelevant analogies, setting out ad hominem replies (dismissing certain ideas as "Platonic" without any concern over whether or not they are true, perhaps a matter of universal rather than strictly Platonic logic -- an example of the genetic fallacy on Robinson's part; and never mind that NT Judaism was already "Hellenized" to a goodly extent), or planting hints of conspiracies (either the standard "Hellenized church" argument, or else conspiracies that are so good that they leave no evidence; i.e., there's no textual evidence that the Bible's text was altered, but that's only because all the evidence was destroyed). I found this book moderately helpful. It will help us to get past some of the common nitpicks in the popular literature which really aren't that useful, and get down to the brass tacks of deciding whether what the LDS proclaims as their doctrine (or what individual LDS writers proclaim as their doctrine) is actually true. But a cloud lies behind the silver lining for both sides. The bad news for the LDS side is that this book drops strong hints that while they may look good when addressed to the popular countercult literature, most of their arguments won't survive the test of serious evangelical scholarship, such as I have now applied. The bad news for the Christian reader is that this book probably teaches us a lot more about the width of the divide between Blomberg and Robinson as individuals than it does about the divide on the historic and current doctrines of Christianity and Mormonism. I recommend this book highly, but also advise that it be used with caution. If you haven't bought a book on Mormonism yet, or even if you have, you should be very interested in Mormonism 101. McKeever and Johnson's introductory course performs all of the expected functions of comparing orthodox Christian and Mormon belief, and showing how wide the divide actually is. They do this, moreover, not only with quotes from older Mormon sources that speak for themselves, but with up-to-date quotes from current Mormon church officials -- and this, I perceive to be the book's greatest advantage over all others now in the field. That said, I was very disappointed that there was not greater interaction with modern Mormon apologetic efforts. Names like Hopkins and Peterson are barely discovered. I will grant that this was obviously intended as an introductory book. We recommend Mormonism 101 for all who are taking their initial steps into this field -- but be aware of its limitations. It had been five years since Paul Owen and Carl Mosser first published their seminal paper "Mormon Apologetics and Evangelical Neglect: Losing the Battle and Not Knowing It?" Now, some of the most prominent evangelical scholars are entering into the fray. The publication of this anthology is truly a landmark event, and so it merits a detailed look. Chapter 1- "The Apologetic Impulse In Early Mormonism" by Craig Hazen. Hazen sets the table by demonstrating that in its early years, Mormonism in fact held considerable intellectual appeal. For Tekton readers, this chapter alone is nearly worth the cost of the book. Why? Because of J.P.’s piece "The Impossible Faith", which details that early Christianity was a movement what went sharply against the grain of its cultural milieu. Remember how Skeptics quickly said that the same could be said of Mormonism? Hazen (albeit unwittingly) demolishes this claim, detailing how Mormonism in fact was tailor-made to its surroundings, presenting a brand of Christianity that was devoid of nearly everything that early Americans found dissatisfying about the orthodoxy of the time, both in terms of sectarianism and Enlightenment criticisms. Chapter 2 - "And the Saints Go Marching On" by Carl Mosser. One of the co-authors of the famous paper that started it all elaborates on their original thesis, discussing the world of LDS scholarship and apologetics. At the end, he lays to rest some of the ways his paper was misinterpreted; "Nor do I believe that LDS scholars can actually pull off their task of rationally defending LDS truth claims...My concern about LDS apologetics is not that Mormonism will be proven true, but that the arguments of LDS scholars will either wrongly convince or shake the faith of those who do not have the skills to properly investigate the issues." (p. 86-87). Chapter 3 - "Craftsman or Creator" by Paul Copan and William Lane Craig. This chapter discusses the biblical, philosophical, and scientific support for the creatio ex nihilo. 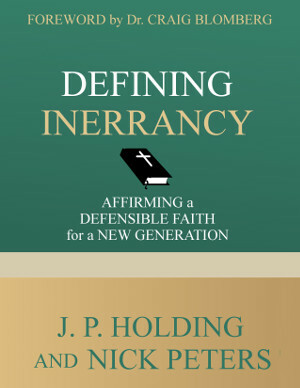 The exegetical arguments are supported by a beefy survey of biblical scholarship on the subject and the authors also note that the LDS have not interacted with it on this topic. The philosophical and scientific arguments are pretty similar to the ones given by Christian apologists in other venues. What the reader may find interesting and provocative, however, is that Craig and Copan argue that the LDS standard works do not, in fact, prohibit such a view. Chapter 4 - "The God of Abraham, Isaac, and Joseph Smith" by Jim Adams. This chapter contrasts the Old Testament view of God with Israel’s neighbors and notes that the LDS view of God has far more in common with the latter. The line of argument is close to that made in James White’s "Is the Mormon my Brother? ", with two main exceptions: 1. Documentation for the LDS view is drawn from the Standard Works, and 2. Much more attention is given to the views of Israel’s pagan nations. Chapter 5 - "A Tale of Two Theisms" by Stephen Parrish with Carl Mosser. A stimulating discussion of the LDS view of God and the implications of a being that is not necessary but contingent. In conclusion, the authors maintain that the LDS God, as well as the universe, exist for no reason at all and that this view cannot account for the order that exists in the universe or provide any ultimate solution to the problem of evil. Chapter 6 - "Moral Law, The Mormon Universe, and the Nature of the Right we Ought to Choose" by Francis Beckwith. Those who have enjoyed Beckwith’s other writings will not be disappointed here. While noting the substantial agreement between Mormons and evangelicals on moral beliefs, he comes to the conclusion that the LDS view of God cannot be the source of absolute moral law. This undermines any belief in moral realism, and we are left with the uncomfortable position that morals are purely arbitrary. He does, however, believe that there is room for evangelicals and Mormons to work together in confronting the moral problems of our society. Chapter 7 - "The Absurdities of Mormon Materialism" by J.P. Moreland. The title of this chapter echoes that of an 1849 publication by one of Mormonism’s premier early thinkers, Orson Pratt, who argued against immaterialism, and is a rebuttal to that thesis. There are two things that can be taken from this section. One is that since Mormonism initially tried to cater to the Enlightenment thinker, it is open to many of the same criticisms that atheism/agnosticism is. Secondly, many LDS have difficulty understanding why evangelicals believe certain doctrines about God’s attributes are considered essential. This section shows their great importance. Chapter 8 - "Monotheism, Mormonism, and the New Testament Witness" by Paul Owen. Mormons have recently been citing certain liberal biblical scholars in order to provide support for their belief that the Bible does not teach strict monotheism. Owen answers this charge, showing how the work of the cited scholars is flawed. He also charges that the views of these scholars is also inconsistent with the LDS view on the Bible’s origins. Chapter 11 - "Rendering Fiction" by David J. Shepherd. Comparing the Book of Mormon with the Hebrew text and the KJV, Shepherd concludes that there is sufficient evidence to show that it falls into the genre of "pseudotranslation", using The Living Bible as a parallel case study. There were a few things that raised my eyebrows about this work in the context of Mosser and Owen’s mission. First, only half of the chapters in this book really interact with and reply to contemporary LDS scholarship, which seems a bit peculiar in the light of their warnings. A number of points are raised that no LDS scholar has delved into. Moreland’s chapter is in reply to Orson Pratt, who is obviously not contemporary. The work of Hugh Nibley, whose work Mosser and Owen said was being ignored, is scarcely mentioned. This, however, does not in any way detract from the quality of the information in the book. And, on the other hand, Mosser and Owen also stated that the LDS had successfully answered a good chunk of the typical evangelical criticisms of LDS beliefs. Obviously, then, new criticisms must be raised, which this book does quite admirably. It should also be pointed out that the authors do state that they intend for this to be the first of several volumes. Secondly, the authors are quite adamant that the purported changes in LDS thinking should be accepted at face value and that they are not part of some slick, massive PR effort designed to make the LDS church look more like evangelicalism. If you are skeptical of this, then you need to read this book. The authors document that there has, in fact, been significant shifts in LDS theology in recent years that are indeed closer to Christian orthodoxy than traditional Mormon doctrine. It is happening because Mormons are turning their focus towards both the Bible and the Book of Mormon, which is largely orthodox in its teachings. LDS theologians who think along these lines are becoming quite a force in influencing the minds of the LDS laity. Having said that, I don’t think the view that there is an attempt to minimize differences for PR purposes is altogether unjustified, either. As evidence that Mormon thought is changing, Blomberg cites President Gordon Hinckley as saying that he is unsure if the LDS really taught the doctrine of deification. However, his source for that quote (The Ostlings’ Mormon America) also mentions that Hinckley appeared in the Mormon Tabernacle shortly thereafter and told the audience that he was misquoted (and thus did believe this doctrine). It is not an either-or situation. Indeed, this is probably the chief reason for evangelical skepticism. If prophets are true, and were so important to the church’s restoration, shouldn’t one believe what they say, especially in the light of Deuteronomy 18:20? Nonetheless, it is important to meet Mormons where they are at, even if they currently don’t have an explanation of how they got there. Certainly, the Mormons will respond to this work. Their response will be telling. Of almost equal interest, perhaps, is the response of the counter-cult movement. They are not portrayed in a favorable light. They cannot, however, avoid it and retain credibility. Those who share their faith with their Mormon friends and associates would do well to learn about and understand the LDS church; not just it's theology, but it's culture and insistutions as well. This is often a difficult task; few books examine Mormonism as a sociological entity, and the ones that do are usually severly limited in scope. This deficiency has been remedied by the Ostlings’ comprehensive, highly readable, and objective study. Every nook and cranny of Mormonism past and present is described in lavish detail. Whether it’s discussing the trek from Upstate New York to the Salt Lake Basin, battles with the U.S. Government over polygamy, the activities of the church’s young missionaries, famous Mormons like the Osmond family, other LDS splinter groups, various theories of Book of Mormon geography, or the reaction in LDS circles to the controversial book How Wide the Divide?, this book painstakingly avoids perpetuting unfair stereotypes or sugar-coating over the church’s most explosive controversies. The book carries the endorsements of both Evangelical acadamians Richard Mouw and Mark Noll, and LDS historian Armand L. Mauss. Regardless of how long you have studied Mormonism, you will learn much from this book. In most cases, we prefer to simply not post reviews of books we do not recommend. But these exceptions are warranted. The God Makers, both the book and the movie, has been very popular among evangelicals since its publication fifteen years ago. Several members of my church have been recommending it to me for some time. Even the cashier at the store where I bought my copy told me it was a great book and I should see the movie, too. Unfortunately, the people who say this really don't know what they're talking about. The God Makers is probably the most horrible dissertation on Mormonism that I have ever read in my life. To say the least, this book is overrated. The cover says that the book is well-documented, and it probably is, except for the fact that most of Decker and Hunt's documentation isn't good at all. Often quotations are taken far out of context, and plenty of the documentation comes from nineteenth-century Mormon sermons that are not even remotely close to doctrinal (but the reader might think otherwise from the number of times Journal of Discourses and Times and Seasons is referenced). Other times the documentation given doesn't support the statement made. For example, the authors claim that prior to 1978 it was "established Mormon doctrine" that blacks would not hold the priesthood until after the resurrection. They list several sources for this, none of them doctrinal, none of them from the 20th century. Another major flaw of the "updated and expanded" version is its failure to interact with LDS responses to the book. While the book has been updated with plenty of irrelevant information (like how Decker made much over a statue in the North Visitor's Center at Salt Lake City), the authors seem to be unaware that scholarly responses to the claims made in this book exist. As this book has been widely touted, it has also been widely responded to, but the authors have chosen to ignore those responses. For example, they spend plenty of time addressing the LDS belief in deification; they don't say a word about the Biblical and early Christian passages Mormons use to defend this doctrine. In short, you would be better served with another resource like the ones above.